Beautifully landscaped pools and outdoor living areas don’t come cheaply! Make sure you have a clear understanding of the likely cost before you commit to anything so you can tailor your plans to your budget. A sketch design and opinion of probable cost for a fully integrated indoor/outdoor living area is a good start – co-ordinated by your architect in conjunction with a pool builder. Swimming pools require building approval before installation. Make sure that your pool builder consultant or your installation contractor is arranging all necessary permits and make sure you get copies of all documents. Check that they understand the recent changes to the Building Code of Australia in relation to pool safety. As with any home improvement work, quotes from at least three registered and reputable contractors is a must. Make sure the work is independently inspected and that all site safety requirements are being observed during construction. Finally, sustainability is also an issue. 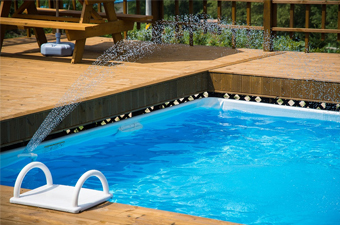 Consider a pool cover, an energy-efficient filtration system, rainwater collection for topping the pool up and various types of heating in cooler climates.